Despite a horrendous title, and cheesy-looking DVD cover art, a quick read of the plot synopsis and interesting casting has me chomping at the bit to give this flick a look. Kevin Corrigan is far from a household name, and probably doesn�t even jump to the forefront of casual filmgoers� collective memories. The more avid, modern film buff, however, is very familiar with Corrigan�s litany of supporting roles that always add an extra punch to a movie, whether it needs it or not. 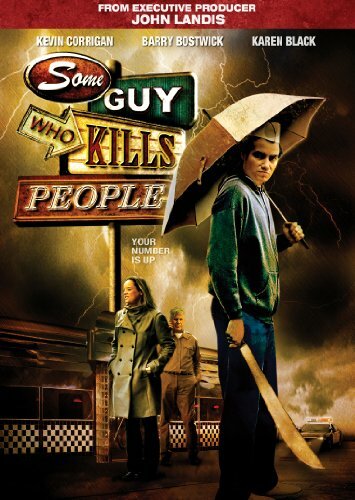 He�s appeared in unknown gems like The Last Winter and Big Fan, higher-profile films like Superbad and Pineapple Express, and has done some excellent TV work, but Corrigan finally gets the meaty, lead role he deserves in the aptly-titled Some Guy Who Kills People. Unfortunately, the film is as uneven as Corrigan�s career, but certainly none of the fault for the film�s flaws can fall on the shoulders of this great genre actor. Ken Boyd (Corrigan) as just been released from a mental institution and is trying to return his life to normalcy while making ends meet working at an ice cream parlor. He can only keep things so normal, though, as Ken harbors quite a bit of anger for the individuals who drove him to his psychological incarceration. Strangely, these same individuals began showing up dead, having been gruesomely murdered one-by-one. At the same time, Ken meets his estranged daughter, Amy (Ariel Gade), and, as they begin getting closer, his revenge-driven anger begins to subside. Still, such a burgeoning father-daughter relationship still might not be enough to keep Ken from acting out on his homicidal tendencies. There�s a scene early on where a pair of cops reel off some axe-related puns, but, instead of being funny, this scene grinds things to a halt. The scene is also trying to be funny in a self-aware way, but even that aspect of the joke fails miserably. A misguided sense of humor isn�t the films main problem, though, as that can be attributed to some of the worst pacing I�ve seen in a long time. A film like this (with a title like this) is supposed to be fun, quirky, and inherently fast-paced. Instead, it takes forever for the story to find its footing, and when it does, it�s far too late. We�re also saddled with one of the worst performances by a child actor in quite some time, as Ariel Gade clearly still has some learning to do as she becomes an adult actor. She was solid as Jennifer Connelly�s daughter in 2005�s Dark Water, but she hasn�t worked much since and it shows. Amy should be a critical part of Some Guy Who Kills People, but Gade�s extremely wooden dialogue delivery and overall awkwardness drags the film down. The majority of the rest of the cast here is very good, but some of the performers take an over-the-top approach to their hokey characters, and go way too far. Megaforce�s Ace Hunter, himself, Barry Bostwick is great, at times, but he�s also half of the duo responsible for the aforementioned axe-related pun sequence. Karen Black (Trilogy of Terror) is also a bit too much at times, but the overall approach to her character fits the film�s theme and tone quite well. The real standout, aside from Corrigan, is Lucy Davis (Shaun of the Dead, the UK version of The Office), who does enough with her limited screen time to make the film much more engaging than it is otherwise. Davis is actually a huge part of the film�s much-improved final half hour, but unfortunately, the �twist� ending is far too easily telegraphed and clich�d to be effective, and none of the film sticks with you after the end credits are through. Anchor Bay�s DVD is a very impressive release, beginning with the stellar 1.78:1 anamorphic widescreen presentation. Handling contrast and black levels incredibly well, this transfer also benefits from a rich color palette and accurate flesh tones throughout. The Dolby Digital 5.1 audio mix is much more vibrant than anticipated, with liberal use of directional effects, solid bass, and crystal clear dialogue being the norm. Surprisingly, we get some decent extras, beginning with an audio commentary track by producer/writer Ryan Levin and director Jack Perez. This is fun, informative stuff, but the highlight of the extras is the inclusion of The Fifth, the 12-minute short film that served as inspiration for Some Guy Who Kills People. There�s also a 13-minute making-of piece, and the film�s original trailer.